Our BROCHURES reveal what we are and what we offer: ASK Trust - a NZ Registered Charitable Trust. Brochures are FREE and are intended for individuals, or business people, medical practitioners and counsellors who may find them a useful addition in reception or waiting room. Download a brochure. (click "Download File" on pdf at right. Then print off as many as you need. or - we will ship (NZ only) bulk brochures (freight charge applies). Our WELCOME BOOKLETS are Great value ﻿at﻿ $NZ15 (+ freight). Read about them below, then click HERE to buy ONLINE. (Pay by bank direct funds transfer). (Single Booklet or bulk purchase OK. Hint: if you know the ASK Trust Panel is speaking at a seminar or conference, then usually the Welcome Booklets are available at the venue). Written by adult autistic members of ASK Trust, the Welcome Booklet was initially aimed at the newly diagnosed adult. Fortyfour pages explain, caution and empower. The Welcome Booklet will also be of great value to the families of autistics and those who work with them. Within its pages, the daily life and social difficulties of those on the autism spectrum is revealed in a concise and highly readable form. Knowing how autistics can, do and must interact with others in the world, will open doors of understanding to those who care for them, who try to understand them and to those who love them. The booklet contains an informative introduction, followed by anecdotes from several authors who describe their personal journeys of self-discovery, and finishes with a large list of further literary resources. "Beyond Diagnosis: Welcome to the Autism Spectrum!" 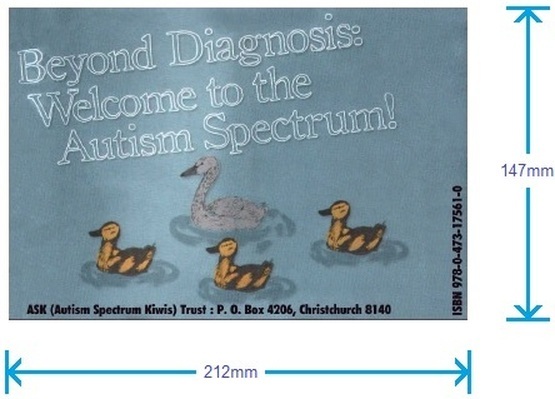 This"Welcome Booklet" as it has come to be popularly known (pictured below), was first published by ASK (Autism Spectrum Kiwis) Trust in 2010. Proceeds from sales of this book are intended to assist in the production of further ASK Trust publications. A Review ~ "... explains well ... the diagnosis ... in a way that ... the triad of impairments really cannot..."
“This booklet will help people recently diagnosed on their journey forward as a person on the Autism spectrum. In addition to valuable reference material, it contains a wide and healthy range of perspectives about diagnosis, meaning, feelings, disclosure, and other key topics”. “The booklet makes it clear how the autism community is flourishing, suggests positive first steps to participation, gives a pathway to meeting and respecting others after such a life-changing diagnosis, acknowledges it is just as OK for us to be ordinary as gifted, explains well what the diagnosis all means in a way that a recitation of the ‘triad of impairments’ really cannot, and much more”. Selected Quotes from "Beyond Diagnosis: Welcome to the Autism Spectrum!"